Map Shows the Literal Translations of Country Names #ArtTuesday « Adafruit Industries – Makers, hackers, artists, designers and engineers! 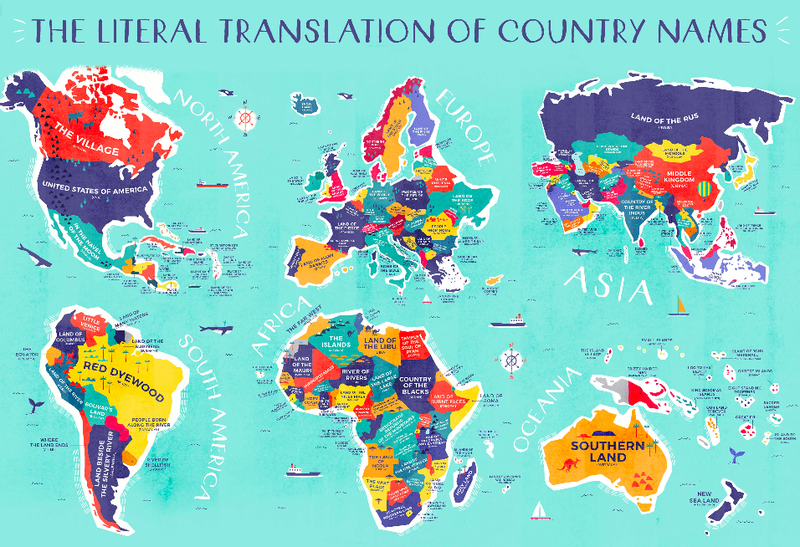 This map shows the literal translation of country names. There are some real gems in on here like: Spain->Land of Many Rabbits, or Mexico -> In The Navel of the Moon. Recently we featured a world map that labels each country not with its name in English, but its name in its own language. That surely proved not just a fascinating linguistic-geographical lesson but, for many, a helpful guide to referring to other lands in a much more sophisticated manner at cocktail parties. But whatever one’s motives, one ultimately has to wonder: what do all those country names actually mean? Few to none would have emerged as random assemblies of syllables; nearly all must have started as descriptions, to varying degrees of literalness, of the places they name.